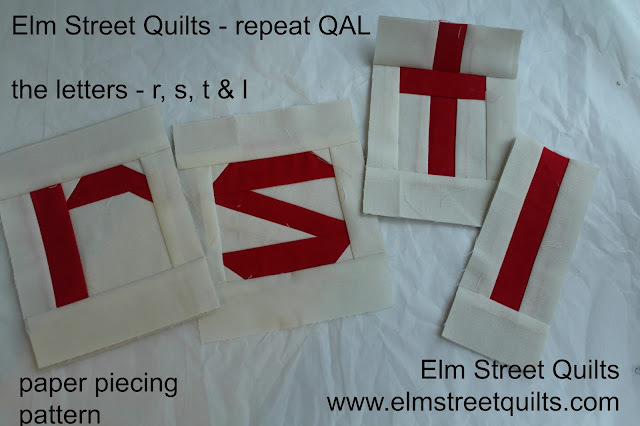 Having fun paperpiecing your quilts? You'll need three (3) t's, two (2) l's and one (1) each of r & s , Print one (1) copy of each of the paper piece pattern. The letter t will be trimmed to 5 ½ x 3 ¾ ''. (Finished size will be 5 x 3 ¼ ''). The letter l will be trimmed to 5 ½ x 2 ¼ '' . (Finished size will be 5 x 1 ¾ '' ). This has been really fun. Thank you so much for all the patterns and support. so excited to do the rest of the letters ! !